WASHINGTON, D.C., May 29, 2017 — Along with the unofficial start of the summer travel season, this Memorial Day weekend marks the beginning of National Tire Safety Week. As millions of motorists take to the road, they will do so on tires that are more advanced than they were just a few decades ago. Tires are the only part of the vehicle that touches the road. Their performance is critical to the strength of our mobile society and the safety of everyone in it. 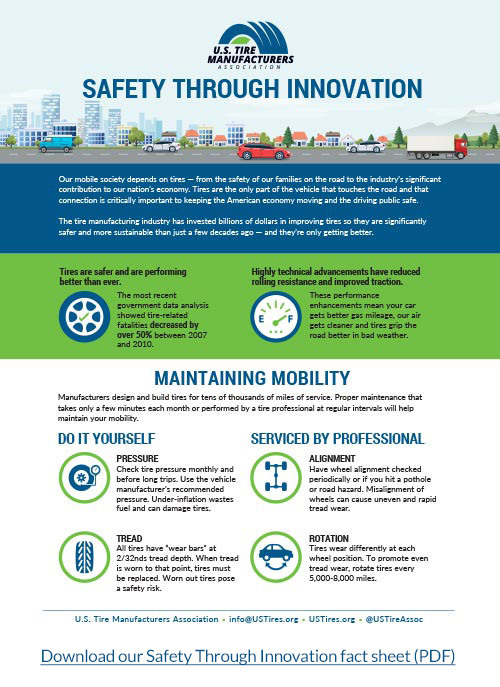 That’s why U.S. tire manufacturers have invested billions of dollars pursuing innovative ways to design and engineer tires that are safer than ever. The investment is paying off: The most recent government data analysis showed tire-related crashes decreased by more than 50 percent between 2007 and 2010. Highly technical advancements in recent years have reduced rolling resistance while advanced tread technology has improved stability and traction in wet road conditions. In addition, run-flat tires keep working for an additional 50 miles after a puncture. During National Tire Safety Week, USTMA and its members also remind motorists how they can help to keep their tires performing at peak safety levels, including simple, basic care they perform themselves as well as scheduling routine professional services. Among the easiest do-it-yourself steps: checking the tire pressure monthly, including the spare, based on the vehicle manufacturer’s pressure settings. Drivers should also check the tire tread regularly. All tires have “wear bars” that are visible once tread has worn to a 2/32nds tread depth. At this point, tires pose a safety risk and must be replaced. Recommended professional maintenance includes tire rotations every 5,000 to 8,000 miles and wheel alignments, especially after striking a pothole, to prevent uneven or rapid tread wear. National Tire Safety Week is supported by USTMA members: Bridgestone Americas, Inc.; Continental Tire the Americas, LLC; Cooper Tire & Rubber Company; The Goodyear Tire & Rubber Company; Kumho Tire U.S.A., Inc.; Michelin North America, Inc.; Pirelli Tire North America; Sumitomo Rubber Industries. ; Toyo Tire Holdings of Americas Inc. and Yokohama Tire Corporation. About U.S. Tire Manufacturers Association: The U.S. Tire Manufacturers Association is the national trade association for tire manufacturers that produce tires in the U.S. For more information visit www.USTires.org and follow us on Twitter @USTireAssoc.